Glittery French Manicure tutorial | Memorable Days : Beauty Blog - Korean Beauty, European, American Product Reviews. 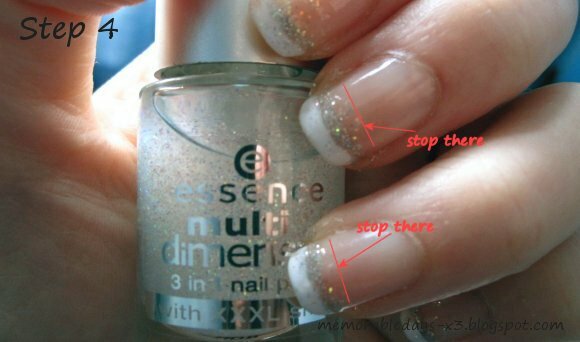 Step 2: Apply a white nail polish on your tips of your nails, just like french manicure. Try to do this as straight as possible, you can also use tape. Let this dry. Step 3: Apply a gray line under the white line. I did this with a glittery tip painter. Let this dry. Step 4: Apply another glittery nail polish on your tips. Look at the red lines, you only need to do the tips and not your whole nail. Wait till it is dry. 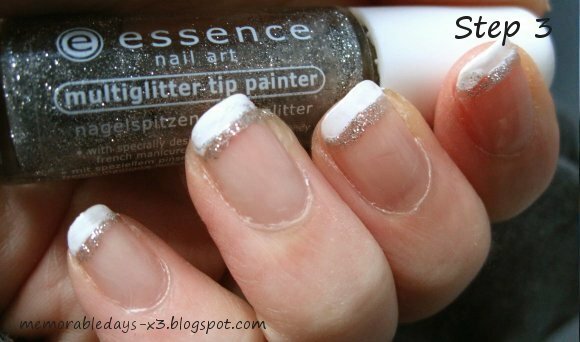 - Step 4: Multi dimension 3 in 1 nail polish with XXXL shine from Essence. i love how amazing but simple they look. you did a very neat job with them! Your nails look sooooo pretty. Totally jealous <3 And thanks for the tutorial ! I love how it's so clean and simple (: Much better than all those cluttered looks I've been seeing everywhere lately ! 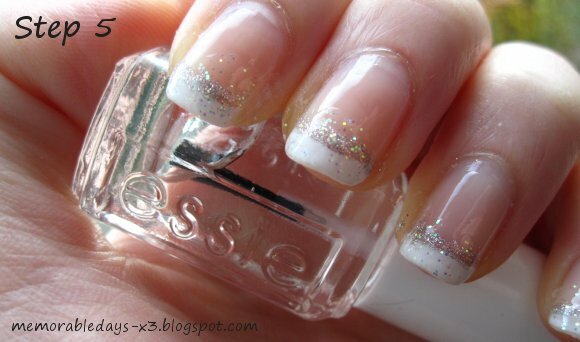 This is a really cute french manicure! I would love to do french manicures, but I can't stand long nails. hahah They look so niceee though. really cute nail - love the glitter touch! There are great I've just finished mine!!! Super!! Thanks so mutch!!! And by the way make another for xmas!!! Yeah, I have also done french manicures to my nails. Its already famous in europe and now, its becoming quite famous world wide.